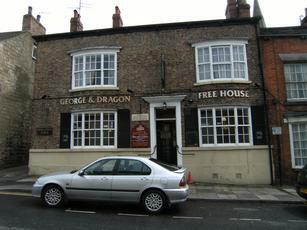 Large boozer just away from the town centre. Quiet earlier on in terms of custom (not music) on a Saturday night but got busier after 11pm when other places closed. Three ales on: Daleside Blonde, a mild from Theakstons and Caledonian Flying Scotsman. Daleside was fine and priced at �2.80 which seems to be about standard from Knaresborough. The "Top House" has just re-opened, 24th November, 2010, following a change of landlord and a re-furbishment. The couple who are running it evidently used to run the Groves some years ago. The four handpumps had 2 x John Smiths, Daleside Blonde (I think this is 3.9% not 5.9% as previously suggested) and York Guzzler. The Blonde was in excellent condition, a beautiful beer. If the new landlord keeps up the enthusiasm shown by the previous landlord, this will be a good starter/finisher for what now is an excellent "crawl" with a potential for around 28 different real ales avaiable in 4 pubs - the G&D., Cross Keys, Blind Jacks and The Mitre. Hopefully the pub will regain its custom and continue with well kept real ales. Best of luck! Felt like a traditional, real local, but being a bank holiday evening we were the only customers apart from one lady at the bar and a couple with a small child and a nice dog. The one pint I had was acceptable, and the guvnor was friendly. Also known as 'the Top House'. Comfy one room pub serving John Smith's Cask and three or four guests; there were beers from Wold Top, Naylors and York when I visited, a fifth pull was not in use. There is a blackboard showing the choices but its presence totally escaped me until pointed out by the friendly barman. Sadly the York Guzzler was rather flat and dull in spite of being assured it was fresh on. Traditional bench seats and tables with a pool table at one end and a couple of large TVs. D�cor is understated with a few old photos of Knaresborough. This pub seems a little more in tune with the tourist trade than a number of Knaresborough pubs which seem to cater mainly for the locals.